A black-eyed pea is a small, cream-colored, kidney-shaped legume with a black "eye" (hilum) at its inner curve. It is also known as a cow pea or field pea. Under the "southern peas" classification, black-eyed peas are cultivated in North Carolina for both fresh and dried markets. Traditionally, dried black-eyed peas have been valued for their long shelf life and preferred for special occasions that can accommodate the overnight soak and half-day simmer they require. Consumption of fresh black-eyed peas has grown due to modern demands for foods that can be more quickly prepared. Postharvest handling and marketing of fresh southern peas must adhere to strict grading and shipping standards; consequently, the fresh market product is more expensive. Like other beans, black-eyed peas are typically also available frozen and in cans. Black-eyed peas and other southern pea varieties are grown extensively across the southern half of the United States, but production is not limited to the southern regions. Both California and Michigan are large commercial producers of the dried varieties. North Carolina cultivates southern peas from the coast to the mountains, but they are not a major source of income for growers. Most of the crop is for local consumption. Several magical properties and superstitions have been connected to black-eyed peas in North Carolina and elsewhere. Hoppin' John, a dish made with black-eyed peas and rice, is traditionally eaten on New Year's Day to obtain good luck throughout the coming year. 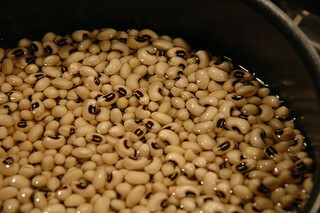 Black-eyed peas are also considered helpful for medicinal purposes, as one technique suggested for the removal of warts demonstrates: "If you rub a black-eyed pea over your wart, then throw it over your left shoulder and go away without looking back, the wart will go away." Black Eyed Peas. Image courtesy of Flickr user Travis Nep Smith. Available from http://www.flickr.com/photos/nep/2783599/ (accessed June 14, 2012). 1 January 2006 | Zimmerman, Carmena B. When can you see black eyed peas here in NC? Unfortunately, NCpedia doesn't have a list of companies that sell black eyed peas. You may want to visit your local grocery store and look for black eyed peas. When they're in season, you can find them fresh in the produce aisle and throughout the rest of the year they're usually available canned and frozen. You may also want to the visit the NC Farm Fresh website at http://www.ncfarmfresh.com/. Farm Fresh is a service of the NC Department of Agriculture and Consumer Services. You can submit your question to them on their "contact" page, and if you're in North Carolina, they may be able to tell you the names of local producers or farmers markets that carry black eyed peas. Good luck and I hope this information helps!